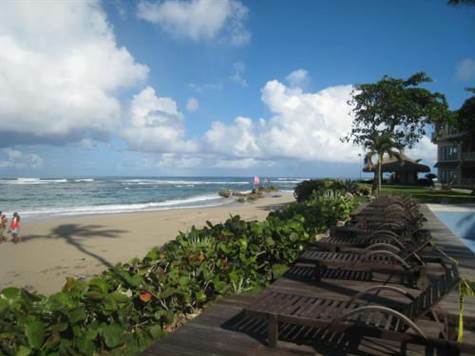 This condo sits on the west end of Cabarete Beach where kite boards abound and the ocean is gorgeous. Large living area, huge deck, lovely furniture and views everywhere. The common areas sport an oceanside pool with two jacuzzis as well as large covered sitting area, all overlooking the amazing beach and ocean. For oceanfront living or renting, this condo is a total winner. Master bath with whirlpool tub, double sinks and lovely stone work. Tropical landscaped common area with shade and fantastic beach. ▪ Large granite kitchen with beautiful cabinetry, stone back splash, tile work, stainless appliances. ▪ Large closets and storage areas.